Home » celebration , history , russia , soviet union , space age , yuri gagarin » 50th anniversary of Yuri Gagarin's flight into space! 50th anniversary of Yuri Gagarin's flight into space! Longtime readers of this blog know that one bit of history that I'm particularly fond of is Russian space exploration. Say what one might about the policies of the Soviet government during those early years, I can't help but have huge appreciation for the engineers and pilots who took part in that endeavor. It wasn't politics that drove those men and women: just good ol' human adventure and tenacity. So that said, The Knight Shift salutes the memory of Yuri Gagarin, who on this day in 1961 became the first human to journey into space... and not only that but became the first person to complete an orbit of the Earth! His flight aboard Vostok 1 would be his only spaceflight. And unfortunately a few years later Gagarin perished during a training flight in a MiG 15. He was only 34 at the time. I don't look at it in terms of nationalities. I much prefer to see things on a larger scale. Gagarin was the first human to leave the confines of Earth's gravity and atmosphere. And just think: a little more than eight years later, we were walking around on the Moon. Kinda makes you wonder whatever happened to that kind of gumption. 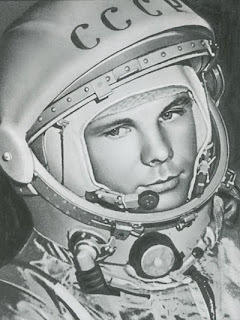 But on this day, we honor Yuri Gagarin: the first man in space.